What Is Nitro Beer and Why Is It Becoming So Popular? It’s easy to see that beer trends can spread and become insanely popular. Just take a look at the spread of craft beers into mainstream society over recent years. One of the latest trends we’re seeing take off is that of nitro beer, or nitrogen infused beer. What’s unique and special about this kind of beer? If you are a brewer or a bar, you know how important the mouth feel is to the beer you are making and serving. It is everything. When a beer has a better mouth feel, it’s more enjoyable to drink and provides a more immersive experience. Nitro beer provides a great mouth feel, so it’s no surprise that it’s becoming very popular and likely to become more mainstream in time. Here is a closer look at what nitro beer actually is and why it is continuing to grow in popularity. Also, we’ll look at how to make it in your brewery or bar with an on-site nitrogen generator. Have you heard of nitro beer or seen it on a menu and wondered what’s unique and different about it? Rather than the typical amount of carbon dioxide normally used to carbonate, nitro beer uses more nitrogen than carbon dioxide to create the effect. The result is a smoother mouth feel that’s easy to enjoy. Brewers use nitrogen gas and infuse it into the beer to change the consistency and the drinking experience. When brewers use a nitrogen gas generator, the finished product comes out differently than regular beer because the nitrogen affects the water in the beer differently than carbon dioxide does. Nitro beer, which you may have heard called nitro pour or brew, excites beer drinkers because of its characteristics. That’s why it’s becoming so popular. Nitro beer gives a smooth mouth feel with a thicker consistency and large, long-lasting head. A cool feature is that the bubbles in nitro brew have a descending look while those in carbon dioxide beer take on an ascending look. How Can You Make Nitro Beer? Any brewer can start making nitro beer as soon as possible with the right tools. Or your bar can use an on-site nitrogen generator to add nitrogen to beer when pouring it. As popularity grows, more and more people will be looking for nitro pour from your brewery or bar. The Brewing Process Method: If you are in control of the brewing process at large brewery or microbrewery, your brewers can add the nitrogen during brewing, which only requires the on-site nitrogen gas generator. The Pouring Process Method: Adding the nitrogen during the pouring process requires more tools and steps than just the nitrogen generator, yet is perfect for a bar or other venue serving the beer instead of brewing it. In this case, you would normally need nitrogen cylinders that are delivered, along with a nitrogen regulator to go on the nitrogen cylinders and a specialty faucet that removes some carbon dioxide from the beer. Instead of cylinders, you have the option to purchase a nitrogen generator to go behind that bar that will create nitrogen on demand. With this option, you can skip the ongoing price and hassle of buying cylinders and you always ensure you have enough nitrogen to fit your needs. Breweries can create special nitrogen beer from the start, while bars have the option to add nitrogen when pouring the beer. Nitrogen generators for breweries help brewers create beer that’s made with a carbonation composition of 70 percent nitrogen and 30 percent carbon dioxide. 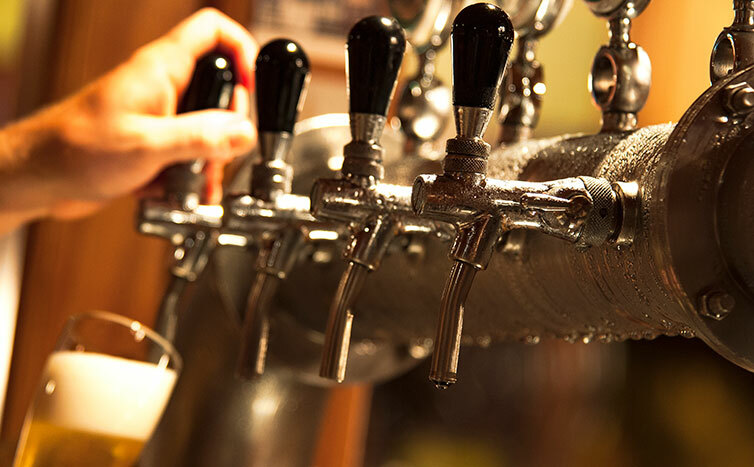 Whether you have a large brewery or a microbrewery with craft beers, nitrogen generators for breweries that are located on site can fit the needs of your specific business and provide benefits. A business can initially invest in a nitrogen generator for a microbrewery and then prevent the ongoing cost of purchasing nitrogen cylinders. You can skip the deliveries, empty cylinders and other inconvenient aspects of that method, which ends up wasting money, time and nitrogen gas in the end. Plus, you could run out of nitrogen with the cylinders. By having nitrogen generators for breweries on site, you can always make new nitrogen to fit demand. Plus, the business can use a nitrogen generator for a microbrewery for the other uses of nitrogen that commonly take place in a brewery. An on-site nitrogen gas generator can take the place of cylinders for cleaning tanks between brewing batches, pressurizing kegs and moving beer from tank to tank. Bars, beer gardens, restaurants and other venues or events serving beer don’t have to buy specialty nitro beer from breweries unless they want to. They have the option to create nitrogen-infused beer when they pour the beer. They can have an on-site nitrogen gas generator that conveniently fits behind the bar, along with a specialty nitrogen faucet, allowing bartenders to add nitrogen and remove some of the carbon dioxide as they pour to create that frothier, thicker and smoother beer their customers are asking for. As you can see, having an on-site generator gives numerous benefits to breweries, microbreweries and bars. By having the generator on site, you are able to create as much nitrogen as you need when you need it, allowing you to fit sudden or ongoing customer demand for this type of beer. Popularity has been rising for nitro brew, as people discover its smooth mouth feel with a great head and thick, satisfying consistency. Look through On Site Gas Systems website information to find the on-site generator that would best fit your bar or brewery.